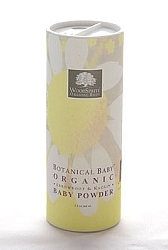 DISCONTINUED--LIMITED QUANTITY AVAILABLE: Our gentle, absorbent baby powder is made from organic arrowroot, organic lavender & rose petals, along with kaolin clay for maximum soothing and silky comfort between diaper changes. Absolutely No Artificial Colors, Fragrances or Preservatives. Never Animal Testing--Cruelty-Free. Ingredients: Ingredients: *Organic Arrowroot, Kaolin White Clay, *Organic Rose Petals, *Organic Lavender, *Organic Calendula, *Organic German Chamomile, Zinc Oxide, Pure Essential Oils of *Organic Lavender, Ylang Ylang, *Sweet Orange, Roman Chamomile & Peru Balsam. (*Certified Organic) 3 oz. net wt. Recyclable Paper Cylinder. Earn 7 Loyalty Points when you buy this item! We are sorry -- This product has been discontinued and is now sold out.